Description: It is the common grass with creeping stems bearing roots at the nodes. Leaves of durva grass are linear and slightly rough on the upper surface and margins. This grass bears minute flowers in 3-6 green spikes of 2-4 cm long. How to Grow: This grass is found wild almost all though the country. However, it is recommended to grow it in the homestead because of its great religious and medicinal value and for firm identification. This grass spreads quickly and it needs only a little planting stock (about five rushes) in the beginning to fill in the alloted space. A bed size of approximately 50x30 cms is enough for the home herbal garden. It also comes up very nicely in shallow rectangular pots of the size 50x30cms or shallow circular pots of 40-50cms diameter. 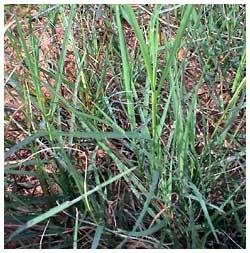 Care regime: This grass is very hardy and grows well even with little moisture. Watering twice a week is adequate. The spread of this grass needs to be kept under control by cutting the leading shoots. Collection: The above ground parts can be cut with the help of knife or carefully plucked with hand from near the ground. This grass spreads quickly and if maintained properly can continue to yield harvest for long.